Lethal injection is injecting a person with poison, usually a fatal dose of drugs so that person will die. This is usually done as capital punishment. It is the main way to execute prisoners in the United States. The idea of lethal injection was first suggested in New York in 1888, but Oklahoma was the first place to make a law that said it could use it in 1977. Texas was the first state to actually use lethal injection for an execution. This first happened when Charlie Brooks was executed in 1982. Thirty-four US states now use it for capital punishment. Other countries to use it are China, Taiwan, and Guatemala. Lethal injection is usually done by using three chemicals. The chemicals are usually sodium thiopental (an anesthetic), pancuronium bromide (used to paralyze the person being injected), and potassium chloride (to stop the heart so that the person being injected dies). In the United States, a chemical shortage has made some states have to wait to inject criminals. Other states have changed what chemicals they use. 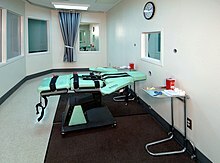 ↑ "HowStuffWorks "How Lethal Injection Works"". people.howstuffworks.com. Retrieved March 21, 2010. ↑ 2.0 2.1 2.2 "HowStuffWorks "How Lethal Injection Works"". people.howstuffworks.com. Retrieved March 21, 2010. ↑ "State by State Lethal Injection". Death Penalty Information Center. Retrieved 7 February 2016. ↑ Horne, Jennifer. "Lethal Injection Drug Shortage". The Council of State Governments. Retrieved 7 February 2016. This page was last changed on 30 April 2018, at 11:10.